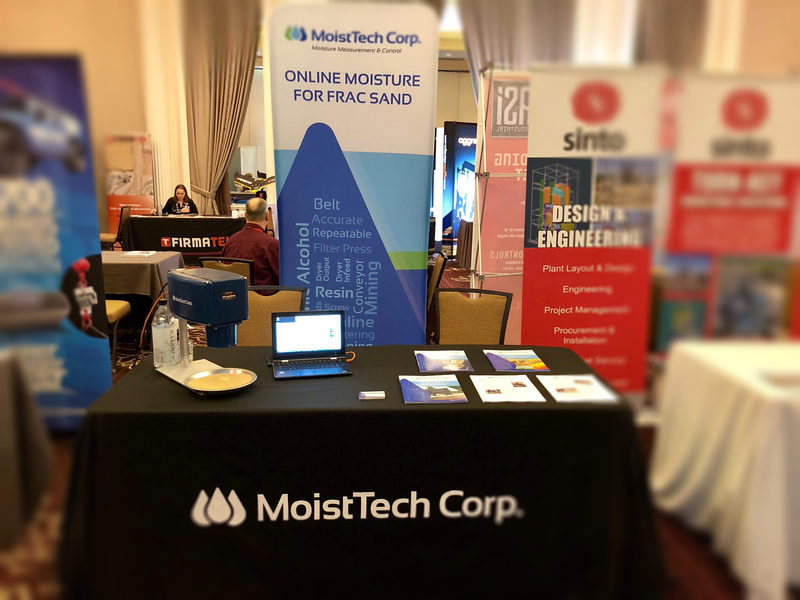 The objective of The North American Frac Sand Conference 2018 is to to bring the frac sand supply chain industry together to evaluate solutions for overcoming the current market and logistical challenges of supplying the sand to well sites. MoistTech Corp. participated in the 2018 North American Frac Sand Conference in Houston TX, February 26-27, 2018. Booth #26 seen some really good traffic and met lots of great people the the industry we are excited to work with! Typically, the frac sand is mined, washed, screened and stored in piles for supply of various grades. The sand needs to be dried to the required moisture content before it can be sold or further processed to add a resin or alcohol coating. Dryers are much more efficient when the input moisture content is consistent. In reality, the moisture content of the sand entering the dryer varies constantly. Typical sand stockpiles can vary from 2%-8% moisture. This variation in the stockpile sand results in heating inadequacies wasting energy, money and out of spec frac sand. MoistTech Corp. has a solution with their IR3000 series moisture measurement and control gauges. Using the 3000 Series sensors, we can rapidly control the drying system resulting in quality spec sand without wasting time, energy and money. Our quality sensors are designed for the harshest of installations. Simple Plug and Play mounting 4”-12” above the moving product we can measure with a repeatability of 0.1% moisture or better. Installation of the sensor is easy and can be in numerous locations depending on your need: Primary Screen, Sump Pump, Dewatering Screen, Dryer Infeed, Dryer Dump, Belt Filter, Press, Discarded Solids, Screw, Belt, and Pipeline. To learn more about how we can measure the moisture in Frac Sand – OR another application you work with Contact Us today! Our YouTube Channel also features videos of our sensor in action – check them out here!